The OECI Yearbook, available on this page as a digital edition, is a publication part of the global dissemination plan of OECI Publisher, formally registered at the Bibliotèque Royale de Belgique, with the Identification Number 12.243 (D/2010/12.243). The OECI Yearbook is a unique promotional tool providing a brief descriptive profile of each OECI Member, the references of the management of the centres and of its contact person. 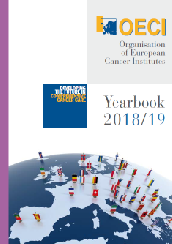 Some pages of this book are dedicated to European Cancer Organisations with whom the OECI currently maintains and develops close collaborations. The main Scientific Events of the year are also announced. The printed version of the OECI Yearbook is available for Members and, upon request, to third interested parties. For more information concerning the OECI Yearbook, or other OECI Editorial activities, please contact: oeci@oeci.eu.